Neuroblastoma is a solid cancer of the nerve tissue of the sympathetic nervous system. 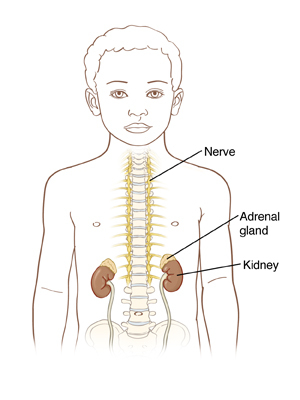 It often begins in the adrenal glands, which are small glands on top of each kidney. It can also begin in the chest, in nerve tissue near the spine in the neck, or in the spinal cord. Neuroblastoma usually begins in early childhood, with about two thirds of the cases presenting before the age of 5. It can be present at birth, but is most often diagnosed much later when the child begins to show symptoms of the disease. In the majority of cases, neuroblastoma has already spread to areas outside of the original site at the time of diagnosis. A conditionknown as “opsoclonus-myoclonus syndrome” can sometimes be a symptom of neuroblastoma. It is burstsof rapid and involuntary, chaotic eye movement in all directions. It is important to note that not all childrenwith this syndrome have neuroblastoma. The diagnosis of neuroblastoma requires the involvement of pathologists who are familiar with childhood tumors, since both the symptoms of the cancer and the cancer cells themselves are similar to those of other childhood cancers. More information on neuroblastoma on the NCI web site – note that you can toggle back and forth between “Health Professional” and “Patient” versions. Bone marrow aspirates and biopsies determine if the bone marrow is involved. Bone itself is assessed by metaiodobenzylguanidine (MIBG) scan (and by technetium 99 scan if the results of the MIBG scan are negative). The abdomen and liver are assessed by CT scan and/or MRI; the chest should be examined by CT. Treatment for low-risk patients can be either “watch and wait” to see if the tumor disappears on its own, surgery alone, or surgery and a few months of chemotherapy (carboplatin, cyclophosphamide, doxorubicin, and etoposide). Intermediate-risk patients receive surgery and 12-24 weeks of the same chemotherapy. Treatment for high-risk neuroblastoma includes aggressive multi-agent chemotherapy consisting of very high doses of the drugs listed above and usually also ifosfamide and high-dose cisplatin. After the patient has shown some response to this chemotherapy, the tumor is removed by surgery, followed by myeloablative chemotherapy, radiation of the tumor/metastases site, possible total-body irradiation, and autologous stem cell transplant. After recovery, patients are treated with oral 13-cis-retinoic acid for 6 months. The symptoms of neuroblastoma are caused by the tumor pressing on nearby tissues as it grows. Its symptoms mimic many other diseases and its diagnosis can be complicated. Even a pathological study (biopsy) might reveal cells that can resemble other small round blue tumor cells, like lymphomas and rhabdomyosarcomas. Only a pathologist familiar with neuroblastoma can distinguish the difference (neuroblastoma is rare, and not every pathologist has seen these cells). Approximately 500-1000 cases/year in the US . 8% of all cancers, but responsible for over 15% of deaths. Median age at diagnosis is 2 years old. In 70% of the cases the disease has spread to other parts of the body at diagnosis. The prognosis for high-risk neuroblastoma was 20% until recently. Encouraging developments are increasing the chances of survival.